Welcome to Mentor for Bank Exams. 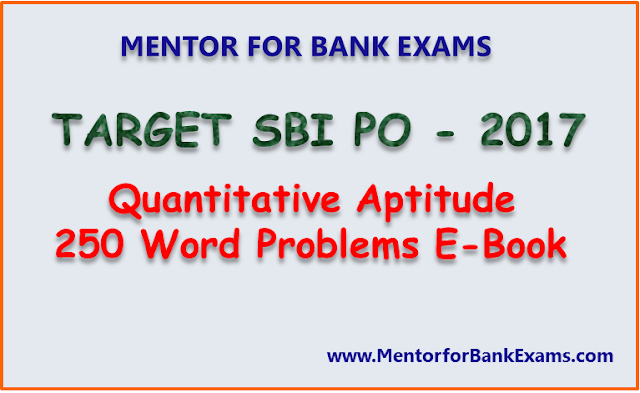 As a part of Target SBI PO 2017 today here I am sharing Quantitative Aptitude 250 Word Problems E-Book based on the latest pattern. As you have seen throughout in the Quantitative aptitude section of banking papers such as SBI PO, IBPS PO, IDBI, IPPB that the level is upgraded to a much higher difficulty level and pattern is changed completely, so here I am providing you with these new pattern questions with well explained solutions which will give you a head start in an arduous journey which you are about to embark. Yes students you got it right. Desire is the key to motivation, but it's determination and commitment to an unrelenting pursuit of your goal - a commitment to excellence - that will enable you to attain the success you seek. If you don’t start now you will be left behind in this race.